In 1878 Mrs W C Browne, wife of the Member for Singleton, gathered together a group of women to discuss the merits of establishing a children’s hospital in Sydney. With the support of the medical establishment and a number of prominent Sydney citizens, a committee was formed that set about raising the funds required to purchase a suitable building. Within eighteen months the committee had raised £4,500 to which the government added a further £4,250 by way of a grant. On 1 January 1880 The Sydney Hospital for Sick Children opened on the southern corner of Glebe Point Road and Wigram Road, where the Glebe Library and surrounding gardens now stand. Sir George Wigram Allen was appointed the first President and the Allen family maintained close links with the hospital for many years, often entertaining the hospital staff and convalescing children at Toxteth Park. When the hospital opened in 1880 there was no Health Act in New South Wales, no branch of the Medical Association and no medical school for training doctors. The training of nurses was still in its infancy and it was not until 1889 that a program of tuition at the hospital was formalised through lectures and certification. 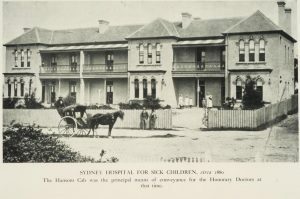 As the first children’s hospital in New South Wales, it catered to the children of the poor and destitute of Sydney and rural New South Wales. Run as a charitable institution with inconsistent government subsidies the hospital struggled for survival, with low admissions during the first few years. The hospital’s annual reports record admissions for a variety of medical conditions and trace the history of infectious and often deadly childhood diseases of the period. Infants were also admitted for corrective surgery due to accidents, congenital abnormalities and conditions caused by malnutrition. Infectious diseases dominated the hospital’s work with diphtheria being the most common. Patients were also admitted suffering from the usual childhood illnesses of whooping cough, measles and mumps often complicated by the onset of pneumonia. Admissions for polio varied as the disease came in epidemics every few years, and hospital records show a low but regular annual intake of children suffering from scurvy, rickets and malnutrition. The hospital soon outgrew its physical boundaries. Whilst maintaining the Glebe site, facilities were leased in Camden as a convalescent hospital and a large outpatients department was opened in Quay Street at the Haymarket. The difficulties of isolating the diphtheria patients from the general hospital population were alleviated in 1893 when Kew Cottage, situated in Glebe Point Road almost opposite the main hospital, was purchased from the Betts family. It was converted into a twelve bed isolation unit with surgical and pathology facilities. Consolidation of the hospital’s scattered amenities and expansion were discussed for almost two decades before the Board raised enough money to purchase six acres of land on the Lucas Estate at Camperdown and preparations for a 175 bed hospital with state of the art facilities were finally undertaken. In January 1907 the last patient was transferred from Glebe to the re-named Royal Alexandra Hospital for Children at Camperdown, which has since been re-located to Westmead. The hospital building at Glebe, initially purchased for £6,250, was sold in 1907 for £2,468.14s and subsequently used as a boarding house or flatettes. It was demolished in about 1963 to make way for extensions to the Homoeopathic Hospital. The plans did not proceed. Kew Cottage was deemed by the government to be unfit for use as a residence after the patients were relocated to the new hospital in Camperdown. It was subsequently demolished by fire in 1907. The annual reports and Minutes of Meetings for The Sydney Hospital for Sick Children are still held in the archives of The Royal Alexandra Hospital for Children at Westmead. For a more detailed insight into the hospital and its medical and nursing staff Dr P L Hipsley’s book The Early History of the Royal Alexandra Hospital for Children Sydney 1880-1905 is invaluable.